Breakfast time agian and my thoughts turn to what to eat! I had some pears left over from my Moroccan dinner and wanted to use them. I was craving for a cheese and fruit combination so the pears were definitely in. I poached them in some simple syrup for added sweetness. Had some ricotta I needed to use up as well. Perfect! – Peel, core, and quarter 1 pear. – Squeeze some lemon juice on the pear slices and toss. – Poach in a mixture of sugar and water (I just did this to taste, no measurements, just based on how sweet you want it. You can also do this with wine…yum!). – Lightly toast a slice of walnut bread (or your bread of choice, but nut breads are nice with this). – Generously spread some ricotta on your bread. 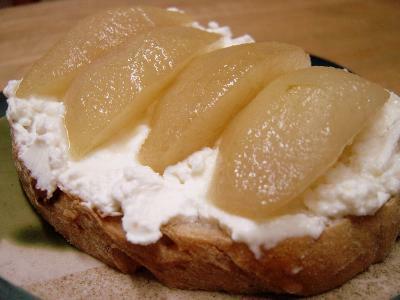 – Arrange the poached pear slices on the ricotta and drizzle some of the syrup over them. Simple, delicious, and sure to put a smile on your face in the morning. If you have an early day and don’t have the time to poach the pears, just do it the night before, so you can quickly assemble this, and enjoy, before rushing off. Yummers! Pears and ricotta are a great combo.